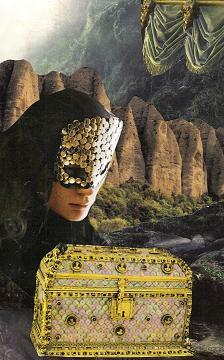 The Secret, collage, SG, 2009. …I´m a man of action, declared Corwin. We have been standing around for enough time now, my legs are practically begging me to start walking! He was standing on the balcony overlooking the sea, with one leg on a low wall, elbow on knee. My lady Vivian, what do you think of our latest findings? Vivian, seated at a table on which lay the remnants of their dinner, made a face. Well, we know that the MerKaBa pendulum indicates the place where we should go next quite clearly. It swung quite wildly on the area around Mount Tsarang. As for Mount Tsarang, the pendulum started swinging to the right almost immediately, and with much clarity. A definite yes. What they would find in this unmapped area was anybody´s guess. The land around Mount Tsarang was yet uncharted, but it was known to be a place of high mountains and deep valleys. A place of secrets, no doubt. Tenwar, who had travelled close to it in his own private explorations of Elvenland presented it as “something like real-Earth Tibet”, a place of far-flung and remote villages and monasteries, half of them quite unattainable; a place of high mountain walls and wild rivers and yes, it had been very cold. Not a lot of air to breathe, Tenwar had said with a wry smile. And certainly, not sounding very welcoming, Corwin had added. How do we get there? Vivian had asked. Pagmooing? We cannot do that without precise coordinates, Ninraen had said. Back in the present, Corwin turned to her. We could pagmoo to the Evendun Hills, and from there, go into the plains with horses. That much we know: there are big flat spaces around Evendun lake, on this side of the map. Isn´t there any other way that we could contact the Watcher? Vivian asked, bringing a dainty cup of precious Elvenland wine to her lips. Surprised by his tone, she looked askance at him. Vivian, haven´t you been trained in Remote Viewing? Couldn´t you…go into the Quantum Field, and Travel there, until you find the Watcher? We could have a session, Vivian reluctantly admitted. Remote Viewing exhausted her, and she did not like to use it. Corwin got down from the wall and walked to where she sat, took a chair at the table, and sighed deeply. I can help you with the first induction, if you trust me. Of course I do, Vivian smiled at him. He was looking tired these days. His skin was no longer glowing, and there was a perpetual downward slant to his lips. What are you so worried about? she asked him. Corwin sighed again, as if searching for more air into his lungs. I have this dreadful feeling of impending doom. I don´t sleep well. It would be so easy to go straight to Mount Tsarang, and just get the damn thing over with, this lingering doubt about the future of our world. I cannot get it, why the humans are so chaos-bent. Something must be dramatically wrong with them, and, as we already know from the healthy Elves, it has nothing to do with the original design for humanity. There is beauty still in the humans, you know, said Vivian, they still show profound feelings about living in their world. But I understand you, there is so much…love, going down the proverbial drain. I cannot understand it, said Corwin, looking disgusted. Don´t they see the beauty, the perfection, of the world? Theirs and ours? He sighed yet again, his forehead deeply creased. Vivian looked at him, her heart full of love. We need to know, Corwin, my friend. We need the Book. Maybe the Book will tell us what happened and why, and what we can do about it. Let´s have this Remote Viewing session tomorrow. Maybe things will be clearer after that. He took her hand and brought it to his lips. Anyway, he said smiling, I´m glad we found each other, and I am glad that we are in this together. She put her other hand on his face. Me too. I´m glad that we are in this Journey together. Whatever happens at the end…If I knew that tomorrow our world should disappear, I would still feel happy today of the time that we have been given. I´m happy to know about Elvenland, the Elves, their work, their way of life, Maiwen, Blaise, Tenwar, Ninraen, Master Orod, all the others that we met while travelling together. It´s been a good time, full of lovely energies and extraordinary beings. And isn´t that what LIFE is all about? To make the most of it while we can? Here in the Imagi-Nation, or out there on real-Earth? Corwin took her hands in his own, and looked deeply into her eyes, the energy between them now forming a warm bubble. His beautiful face, not yet old but not young either, shone like a light in the setting darkness. Really enjoyed the story this morning. I too have been thinking about “secrets” today. I can really sense that you know your characters and the feel very real.